So adorable! I am reminded that my children's kitchen is in dire need of some new play food. 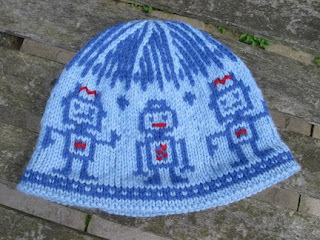 That robot hat is just too cute!! So cute!!! Yes, Swiss people to know doughnuts too! :) I wish you a great time in Switzerland. Do tell me if you come near our place, it would be lovely to meet you! Thank you, CCETSI. We had a lovely visit. Perhaps next time we can meet? I would love that! I don't know where you are... but my guess is near all the other homeschoolers. We were up near Basel. I'm happy to hear that you had a good time. I was a bit worried, as here it was cold and raining almost all the time. Can I email you? It would be so nice to meet you. It was cold and rainy where we were, too. We actually had a bit of flooding towards the end. Such an adventure! I love the knitted foods! My sister makes a donut soap and your knitted one would make a great scrubber "cloth" to go with the soap. You are so sweet, Teresa. :) And I love the names. wow, camping! burr. Very interested to hear all about that! Serious swooning over the knitted food. Those mushrooms! Too cute.